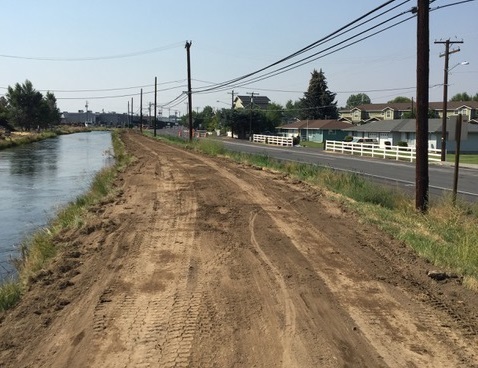 REDMOND, OR -- Construction of Redmond’s new Homestead Canal Trail is nearly complete. Parks Division Manager Annie McVay says Knife River, the contractor for the South Canal Blvd. reconstruction project, is working on the southern portion of the off-street path. "Right now, we’re focusing on the section from Veterans to Odem Medo (pictured); and that’s part of the South Canal street project. If you’ve been out there, you can see they’ve constructed a lot of it, especially near Lowe’s and the new transit hub." She expects that southern section of the trail to be paved later this fall. Portions of the trail, like a section behind Home Depot, on the north end of Redmond, are already paved but don't connect with each other. Eventually, the city will have a continual path from Quince Avenue to Odem Medo. "The northern section of the trail is out for bid right now," McVay tells KBND News, "It’s a different contractor that will be doing Dogwood to Maple. And that hopefully can get done this fall, but if not, we might be paving first thing next spring." McVay says it will provide a safer route for bikes and pedestrians, "It’s the perfect linear path to dissect the city." And, she says it's part of a larger plan, "Also, we’ll be looking at making Deschutes Avenue what we call ‘a quiet street.’ So, that will connect the Homestead Canal Trail to the Dry Canyon Trail." The new route gets its name from the Homestead Canal. But, McVay acknowledges the irrigation district plans to eventually pipe much of the scenic canal that parallels the trail, "The section that is by Homestead Park, which is kind of near the bike park, they were able to deem that section historic. So, it’ll be really great because that section in our park will never be piped."